MANCHESTER, N.H. — A Bible has been returned to a Missing Man table at a veterans hospital in New Hampshire after it was initially removed following a complaint from the Military Religious Freedom Foundation (MRFF). “[A]s of Monday morning, the 18th, the Bible will be in a plexiglas case that was donated by a Navy veteran and will be attached to the table. The case will have the name of the POW the Bible belonged to before being given to a Navy veteran, member of Northeast POW/MIA Network and Purple Heart recipient,” states an update from Bob Jones of the Northeast POW/MIA Network published by the Laconia Daily Sun. MRFF says that it received 14 complaints about the inclusion of the Bible on the foyer-area table at the Manchester Veterans Medical Center. The organization reached to the facility in January to request that it be removed. “[U]nconstitutional POW/MIA displays like the one solely featuring and highlighting the Christian New Testament at issue here in your VA Medical center in Manchester, NH should ‘Honor Them All’ and not just those VA patients of yours who are Christians,” wrote President Mikey Weinstein in one email. Corey Beem, the acting staff assistant to the director of the hospital, responded hours later to advise that the Bible had been relocated. The Bible was then moved to a display shelf, which displeased MRFF and its complainants as being an even more prominent location. 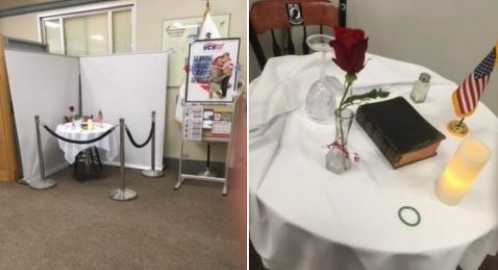 Jones, who is a part of the organization that set up the Missing Man table, thought the decades-old Bible should remain as a part of the display. Earlier this month, the Texas-based First Liberty Institute contacted the Manchester Veterans Medical Center on behalf of the POW/MIA Network to contend that there is nothing unconstitutional about including the Bible on the Missing Man table. “The VA is absolutely within the law in its decision to allow the display of a donated Bible,” Michael Berry, director of military affairs, said in a statement, noting that the Bible belonged to U.S. Army Air Corps TSgt. Herman “Herk” Streitburger, who was a captive in a German prisoner of war camp during World War II. Now, Jones says that the Bible is back. He also appeared before Congress a year later, where he was questioned by Rep. Randy Forbes, R-Va., about his hostility toward Christianity. “On June 16, 2013, you said, ‘Today we face incredibly well-funded gangs of fundamentalist Christian monsters who terrorize their fellow Americans by forcing their weaponized and twisted version of Christianity upon their helpless subordinates in our nations armed forces.’ Did you you make that quote?” Forbes asked.